We prioritize applications, not platforms. We take an app-centric approach to getting data centers transformed, networks ready, and embracing the public cloud - with a plan that supports your prioritized applications. We start with user + business needs, not technical requirements. We define use-cases, and inventory all collaboration and productivity tools. We then create a plan to drive your desired outcomes. We’re focused on SAM in a hybrid cloud world. Our 50+ experts use proprietary tools to deliver a modern approach to SAM. We connect the dots between usage, software and cloud contracts, and deployed assets, to deliver clarity on compliance and ROI. We deliver the right technology where and when you need it. 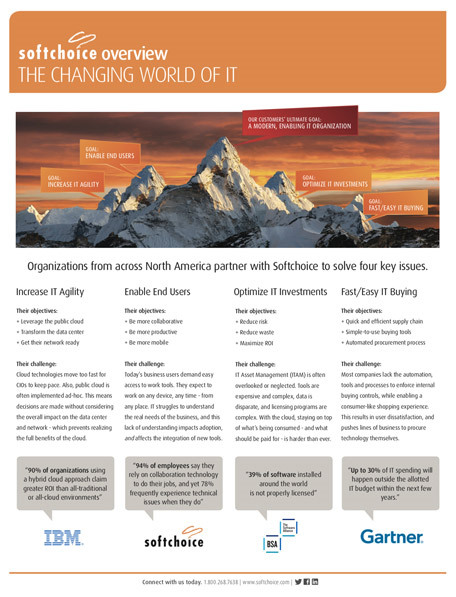 Through softchoice.com, combined with our Inside Sales Account Managers, customers buy technology products quickly, cost-effectively, and in a trouble-free, transparent way. Our combined strength in four areas is what makes Softchoice unique. With the cost and risk of getting it wrong so high, IT leaders like you can no longer afford to apply a cookie-cutter methodology to IT strategy. In a world of Hybrid IT and mobile collaboration, you require solutions based on proven best practices. When our consultants conduct assessments in your IT environment, any technology recommendations or coaching we provide is informed by your specific needs. This translates into better project execution, reduced compliance risk, and more enabled end-users. As one of only twelve Microsoft License Service Providers in North America, Softchoice has 25+ years of experience helping customers select, manage and comply with the largest contract agreements on the market. As an increasing number of traditional software and hardware OEMs move towards new subscription and consumption models for IT assets, the unmatched vendor consolidation, licensing and asset management expertise we provide is now more important than ever. Our Softchoice Keystone Managed Services portfolio of services provides a comprehensive support strategy based on every customer’s unique requirements. This includes 24/7 support, proactive issue resolution, monthly reporting and unlimited mentorship. Our aim is to enable you to do more with less by taking on the day-to-day mundane support tasks your team is already heavily burdened with, and work hand-in-hand with your team to develop new skills. Our people care as much about the outcome of the investment as our customers do. We believe that it’s our obligation to help customers like you to build your own capabilities, while we fill any critical skills gaps you have. Whether it’s through our hands-on educational events, or working side-by-side with one of our Professional Services engineers, the Softchoice community is deeply committed to developing and mentoring your team. Only when our customers stand on their own is our work truly finished. Softchoice is pleased to announce it has once again been recognized as a Best Large Workplace in Canada by the Great Place to Work® Institute. Softchoice is pleased to announce that CRN has named Softchoice to its 2018 Managed Service Provider (MSP) 500 list in the Elite 150 category. 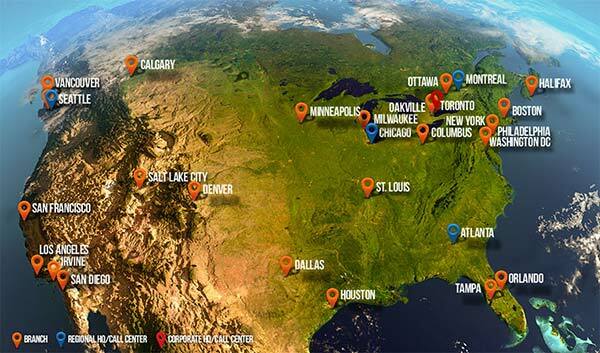 Softchoice has local experts and talented resources in over 30 communities across North America.